The American Eskimo is a beautiful, snowy white Spitz-type dog. It looks like a miniature Samoyed. There are three varieties: the toy, miniature, and standard. That means there is an Eskie for all interests and house sizes. The American Eskimo has a wedge-shaped head with muzzle and skull about the same length. It has erect triangular-shaped ears, and a heavily plumed tail curled over the back. Its neck is well carried and the topline good and level. Good legs and feet allow the Eskie to trot with bold energetic action. The profuse coat is always white, or white with biscuit or cream markings. Their skin is pink or gray. Black is the preferred color of their eyelids, gums, nose, and pads. The coat is heavy around the neck, creating a ruff or mane, especially in males. The breed is slightly longer than it is tall. 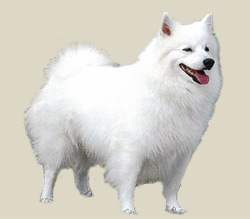 The coat of the American Eskimo should not curl or wave, the undercoat should be thick and plush with the harsher outer coat growing up through it. No colors other than those described above are allowed. The eyes must not be blue and no Eskie may be shown if it is under 9 inches 23cm, or over 19 inches 48cm,. The breed has many admirers and it has withstood the test of time. The American Eskimo is bright, eager to please, lively and fun-loving � in short, an enjoyable and generally obedient companion. True to its spitz heritage, it is independent and tenacious and loves to run, especially in cold weather. But it is among the most biddable of spitz breeds, and it is calm and well-mannered inside. It is good with children, other dogs, and pets and is generally outgoing to everyone. The Eskie is energetic and needs a good workout every day. The extent of the workout depends on the size of the dog, with the larger Eskies needing a good jog or long walk and the smaller ones needing only a vigorous game in the yard or short walk. The larger Eskies can live outdoors in temperate or cool climates, but this breed is so attuned to its family that it does better indoors. The double coat needs brushing and combing twice weekly, more often when shedding. The thick snowy white coat is easy to groom. Brush with a firm bristle brush twice a week. It should be brushed daily when it is shedding. This breed is an average shedder.